By Mugisha Olga Antonella, a 15 year-old girl from the YWCA of Rwanda. 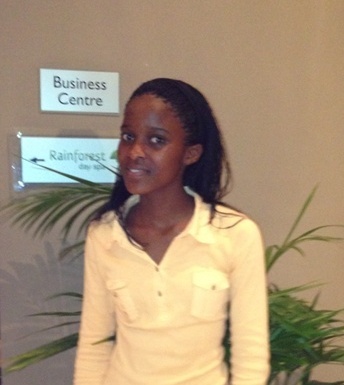 My name is Mugisha Olga Antonella and I am 15 years old from YWCA Rwanda. I am grateful to the World YWCA and the YWCA of Rwanda for giving me the opportunity to participate in the young women’s advocacy training, the 23rd Gender is my Agenda campaign (GIMAC) and the 22nd African Union summit in Addis Ababa Ethiopia. This being my first time to the Africa Union summit, it is a great opportunity for me to interact and share ideas with young women from different countries as the summit has attracted people from all walks of life both young and old. “Her future: The future young women want “the theme, put forward by the World YWCA, has given me a great opportunity to understand clearly the future that I want. A future that puts an end to violence against girls, that puts into consideration SRHR and where young girls have access to education and can be empowered. The different dialogues held at the AU summit have motivated me to work even harder to empower millions of young women around the globe. True, young women have come a long way and are beginning to enjoy more of what their male counterparts do, but a lot still needs to be done. I have been working with the YWCA as a volunteer for 3 years and this has given me ample time to interact with different girls with a number of problems which need to be addressed. The opportunity to be part of the World YWCA pre-AU advocacy trainings, has enabled me to develop my skills in leadership, girl’s economic empowerment and advocacy for girls . I am now able to interact with the world through social media and make my voice heard and can also advocate for the voiceless in my community. As an adolescent girl, I know there are many peers who need information on their sexuality, rights and how can they actively participate in community mobilisation on issues concerning them. This meeting came at the right time because I will use the skills learnt to advocate for the rights of my fellow girls in Rwanda who did not get the chance to attend the summit. I like interacting with different people especially girls from different backgrounds because through this I get to know more about how people live, the kind of problems they encounter. Seeing how my fellow girls suffer is one of the worst moments for me and this motivates me to come out and lend a hand by building their confidence through empowering them. I have learnt a lot during this summit and I will use the knowledge that I have obtained to productive use, especially in our project “young women champions“ when I return to Rwanda. I am now empowered and ready to take Africa to higher heights and being a part of making it the most productive and youth friendly Continent.